The Aspen Institute - - Why Has Trust in Government and Media Declined? …when institutions perform poorly, people lose trust in them. …polarization and fragmentation has shattered the body politic into separate “echo chambers” of groups. Recent revelations of efforts to disrupt the electoral process, sow discord and foster doubts about democratic political processes have created grave concerns. - Why Has Trust in Government and Media Declined? Before offering its recommendations to help restore trust, the Commission needed to examine the causes of the problem. Here we address the causes, first for the loss of trust in government and its democratic processes and, second, for declining trust in the media that are supposed to inform the public about how government and society operate. These explanations are not mutually exclusive. Indeed, it is likely that all of these factors play some role in the overall decline in trust. It is also probable that there are cross-impacts among the various factors responsible for the loss of trust in both government and the media. Why Has Trust in Government Declined? Scholars have offered at least five explanations for the decline of trust in government. They include three big social/political factors—poor institutional performance, large-scale global “shocks” and growing political polarization—and two specifically economic factors—rising economic inequality and declining economic mobility. One indicator of the public’s lack of faith in the effectiveness of government is its view of the competency of political leadership. A 2015 Pew survey found that a majority (55 percent) of Americans believed that “compared with elected officials, ordinary Americans would do a better job of solving the country’s problems.” This trend has continued, as reflected in a 2018 Pew survey, which found that 61 percent of Americans believe that the fundamental “design and structure” of American government needs “significant changes” to address the country’s challenges. Starting with the Vietnam War and Watergate, a series of governmental actions served to diminish public trust. Bad behavior by elected officials—including the Clinton impeachment, after the President was accused of lying under oath; the Iraq War, which turned out to have been launched under false assumptions; a failure to defend against foreign interference in elections; and the gridlock that seems to have dominated U.S. political processes in recent years—provided ample grounds for Americans to doubt the effectiveness of their government. And news media that emphasize conflict, scandal and dysfunction could well be contributing to the loss of trust. To account for a decades-long, worsening “crisis in trust,” the Edelman Reporti points to a series of social and economic developments that have shaken faith in key institutions in the United States and abroad. The Great Recession of 2008. All recessions have negative consequences, but the impact of the 2008 recession was especially severe, creating “a crisis of confidence in traditional authority figures and institutions while undermining the middle class.” According to the Pew Charitable Trusts, combined peak loss from declining stock and home values in the United States totaled $10.8 trillion, or an average of nearly $100,000 per household, during the period from July 2008 to March 2009. Millions of jobs were lost and many state and local governments were forced to reduce their budgets significantly, resulting in cuts to critical services such as public education. Although U.S. economic growth since then has made up for many of these losses, the setbacks and emotional scars from this time still linger. Global migration. The perceived influx of immigrants to the U.S. led many, especially among working-class Americans, to “feel like strangers in their own land.” Demographic and social shifts have also increased tensions around the politics of race and gender. 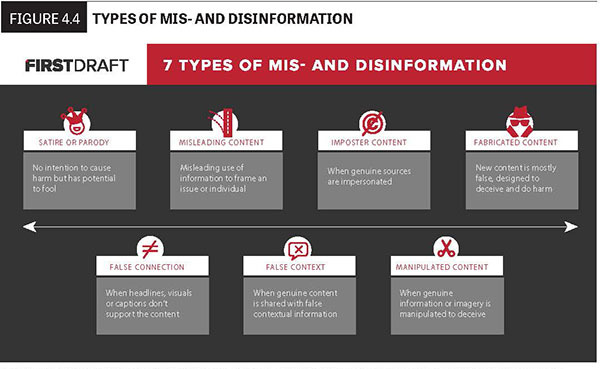 The rise of disinformation. False or misleading news stories have competed with, and perhaps crowded out, accurate stories and seeded doubt about the reliability of news in general, resulting in a sort of Gresham’s Law for information. One consequence of this most recent wave is that, for the first time, the news media are now the least trusted of the various global institutions tracked by Edelman. If citizens believe they cannot rely on media for a truthful account of political activities, doubts about the legitimacy of government and its actions are likely to spread. Disinformation that comes, whether deliberately or not, from political leaders can be particularly corrosive to trust in government. A third factor in declining trust is the steady increase in political polarization in the U.S. This has produced political camps whose views on a wide range of issues have drifted farther and farther apart, increasing hostility across party lines. As the gap has grown, so has anxiety about the other party. It is logical that the “out” faction, whose views and values bear little in common with the party in power, would feel less comfortable and confident, and therefore less trusting, generally, in the way that the “in” party operates the government. Spatial polarization. Another form of polarization is the split in values and perspectives between rural residents and urban dwellers even in the same state, sometimes described as “spatial polarization.” In addition, the United States today consists of liberal “blue states” clustered mainly along the country’s east and west coasts, and conservative “red states” filling the vast but more sparsely populated heartland of the country. Institutionalists vs. insurrectionists. As polarization increases, the notion of government as a joint enterprise that tolerates disagreement but ultimately works toward compromise in order to get things done seems increasingly quaint. In his 2012 book, Twilight of the Elites, Christopher Hayes argues that the country’s political divide has evolved past the traditional distinction between “left” and “right” or between Republicans and Democrats. The country, he suggests, is now divided into two camps that he describes as institutionalists and insurrectionists. Institutionalists continue to believe in the fundamental legitimacy and necessity of a “central repository of authority.” They are therefore committed to defending the current system of government, despite its flaws. Insurrectionists, on the other hand, are convinced that “there is something fundamentally broken about our current institutions . . . and believe that the only way to hold our present elites accountable is to force them to forfeit their authority.” Even when in power, they work to remake or eliminate many existing government institutions, regulations and policies. They see political opponents not as legitimate counterparts in governing but as “enemies” needing to be defeated, even destroyed. While institutionalists see the erosion of trust as “terrifying,” insurrectionists “see the plummeting of trust in public institutions as a good thing.”v Finding a path forward to restore trust in democracy that will be acceptable to both factions will be challenging. The decrease in trust in American institutions, including government and the media, generally correlates with an increase in economic inequality. 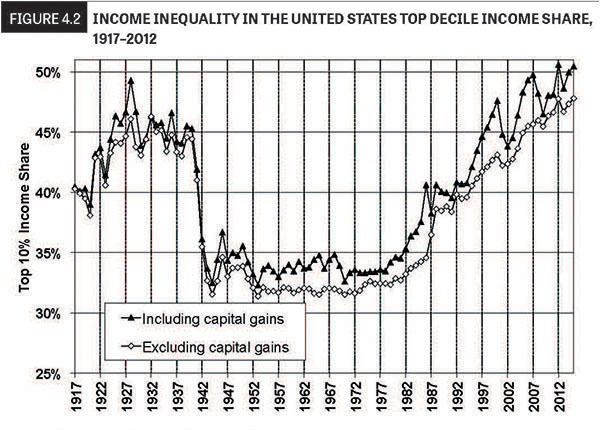 As charted by the French economist Thomas Piketty and others, after a period of declining inequality from the 1930s through the mid-1940s (from the end of the Depression through World War II) followed by several decades of relative stability, inequality began rising sharply in the mid-1970s. It is now at levels not seen for nearly a century and is still increasing (see Figure 4.2). Perception of fairness. Another perspective on inequality and trust comes from Angus Deaton, Nobel Prize-winning economist from Princeton University. He suggests that the key variable in shaping attitudes toward society and politics is not inequality per se but rather the perception of the fairness of the economic system. Deaton argues that people generally accept some forms of inequality—for example, the success of innovators and inventors who reap rewards for their creativity—as fair and therefore unobjectionable. But they perceive other forms of inequality— such as unequal access to health care and quality education, the elimination of pension benefits for workers, anticompetitive practices of large corporations, or government policies favoring businesses over individuals—as the result of unfair economic or political processes. A final factor, related to economic inequality, is the degree of economic mobility. A 2017 study titled “The Fading American Dream” by a group of economists from Harvard and Stanford found that mobility, as measured by the percentage of children who go on to achieve an income higher than that of their parents, has declined dramatically. Mobility has fallen from approximately 90 percent for the cohort of children born in the 1940s, to 50 percent for those born in the 1980s, with the largest declines occurring in middle-class families. The study attributes most of the decline in mobility to the uneven distribution of national economic gains, with most going to the top earners and much less to the rest of the population. According to a 2017 paper by Christian Houle, a political scientist at Michigan State University, “Inequality and social mobility, although related, are fundamentally distinct, and immobility is likely to be perceived as even more unfair than inequality, meaning that it may generate at least as much grievances.… I argue that social immobility fuels political instability.” If, in fact, the key variable in the loss of faith in government is the perception of unfairness, then it would follow that low social mobility is likely to be a significant causal factor. Why Has Trust in Media Declined? The decline of trust in media may be part of a larger decline of trust in a range of social institutions. Yet there are at least six factors that are uniquely responsible for the decline of trust in media and its role as a consistent, reliable source of news and information. These are proliferation of news sources, media disintermediation, confusion between news and opinion, the spread of mis- and disinformation, the decline of local news reporting and politicized criticism of the media. The proliferation of media sources, first through cable and more recently through the internet, has increased the challenge of finding trustworthy sources of news and being well-informed. A 2018 Gallup survey commissioned by the Knight Foundation found that almost 6 out of 10 (58 percent) adult Americans said the increase in information available today makes it harder for them to be well-informed. 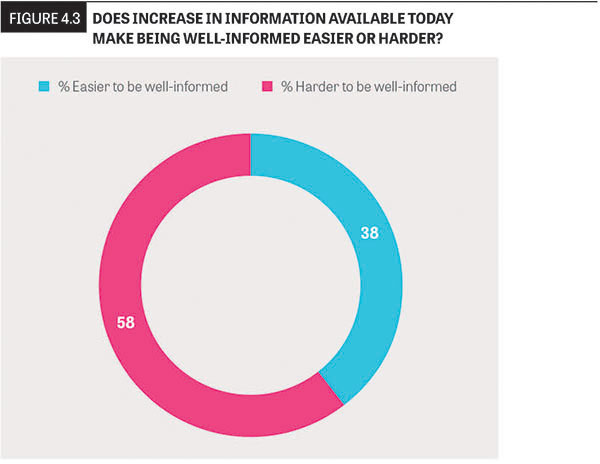 This compared with 38 percent who believed that more information makes it easier to be well-informed (see Figure 4.3). The same survey found that just 41 percent of Americans were confident in their ability to navigate the news environment to remain knowledgeable on current events and determine what is factually true. Source: Knight/Gallup American Views, p. 17. The role of the internet as a source of news has altered the way in which news moves from creators to consumers. As of 2018, according to a Pew survey, 68 percent of adult Americans were getting “at least some” of their news from social media platforms and 42 percent reported that they “often get their news online.” This was just short of the 50 percent who cited television as a frequent source, and well above the portion who rely on radio or print newspapers. News moves online. In the first wave of online news, many traditional publications established online presences and attempted to attract readers to their sites. Initially, most just put the print version of the newspaper online and did not take advantage of technology to engage users and advertisers in new ways or respond to the changing ways people were consuming news and information. Some of these publications have been successful in attracting regular readers and even paid subscribers. As of mid-2018, 2.9 million of The New York Times total of 3.8 million subscribers were digital-only, and as of early 2017, more than half of The Wall Street Journal’s 2.1 million total subscribers were online-only. Readers who subscribe to a specific publication typically understand and trust that publication’s perspective and practices. As platforms have become intermediaries between news sources and their readers, many news organizations are increasingly dependent on these platforms to generate traffic to their sites.vi In the process, the identities of individual publications can become obscured, diminishing the distinction between major publications that have invested substantial resources in professional reporters and editors, and less substantial sources whose commitment to quality journalism can vary widely. American teens and young adults have also found that navigating the rapidly shifting boundaries of online news is challenging. Many young people express low levels of trust and suspicions of bias in the news they encounter online. Youth also report relying more on direct messaging with friends and consulting multiple sources to verify stories found online. This critical function takes place largely behind the scenes (in part to prevent bad actors from gaming the moderation process for the purposes of social, financial or political engineering). But this opacity means that people who increasingly depend on social media as a primary source of news have scant ability to understand or influence the choices made by these platforms that significantly shape their views of the world. As the platforms become ever more dependent on algorithms and artificial intelligence to aid in moderating billions of inputs, critics have called for more visibility and accountability in how those algorithms operate. A fundamental rationale for the First Amendment is to protect the critical role of the press in keeping citizens informed about what their government is doing. During the 20th century, newspapers separated reporting from editorial comment, which usually appeared in a specific, clearly defined place in the paper. Broadcast news (particularly during the time the Fairness Doctrine was in force, 1949-87) focused on straight reporting and largely avoided the expression of opinions about the news. During this time, journalists professionalized and strengthened their standards for objectivity, aiming to provide accurate and unbiased reporting. By the mid-20th century, there was a broad consensus on what constituted news and what should be labeled as opinion. This meant there was relatively little disagreement about what constituted “facts,” even if their meaning was open to debate. Rise of commentary. But the arrival of talk radio and 24-hour cable news channels led to a new emphasis on commentary. As partisanship grew, and the volume of commentary expanded, the consensus on what constitutes “the news” began to erode. The growth of the relatively unregulated internet further expanded the spectrum of voices offering both news and political commentary. One novel development empowered by the openness of the internet has been the emergence online of “citizen journalists,” nonprofessionals who produce and distribute news and information and, in some cases, commentary. In the absence of professional journalists on the ground in the aftermath of Hurricane Sandy, for example, local citizens in New Jersey used Facebook to share important information about disaster recovery. There are scores of other examples of ordinary people sharing photos and videos about important news events on social media from the Tahir Square uprising to the Boston Marathon bombing. While they provide valuable new voices and perspectives, and often serve as the first source of news on breaking stories, they often do not abide by the tenets of professional journalism. These contributors, intentionally or not, can erode the distinction between fact and opinion. More troublesome are political operatives impersonating “citizen journalists,” flooding streams with false content and deploying manipulative tactics to influence users for their partisan interests. In a presentation to the Knight Commission, Wisconsin State Assembly Speaker Robin Vos criticized the tendency of many reporters to ignore what is working in government in favor of stories about dysfunction, conflict and scandals. “Good news isn’t news anymore,” he said. “When good things happen, they are rarely reported, while what is reported is often sensationalized.” Defenders of the press respond that this is not new or even problematic. When things go as they are supposed to, they rarely make news. Still, the perception of bias continues and pertains to all types of media: newspapers, broadcast, cable and online. The confusion between fact and opinion is reflected in the skeptical attitudes of Americans about news. The Knight/Gallup survey reported that more than 60 percent of the respondents see “too much bias in the reporting of news stories that are supposed to be objective,” while less than half (44 percent) can identify any news source that they believe reports the news objectively. Additionally, the survey results suggest that perceptions of media bias are strongly related to one’s political leanings, with “26 percent of Democrats versus 67 percent of Republicans perceiving a great deal of political bias in news coverage.” Finally, of the 69 percent of Americans who reported that their trust in news media declined over the past decade, 89 percent cited “inaccurate or misleading reporting, lies, alternative facts or fake news” or “biased, slanted or unfair reporting” as the reason for the decline. Nearly 100 years ago, Walter Lippmann expressed his concern about the potential of broadcast media to spread propaganda and amplify its power. But traditional media had gatekeepers who were responsible for the quality and reliability of the information they provided. The internet, with its radical openness, has introduced new forms of problematic content. The presidential election of 2016 brought into sharp focus the opportunities for exploitation offered by the internet, particularly the major social media platforms. During and after the campaign, evidence began to accumulate about how a variety of actors used social media to spread false disparaging information, including multiple baseless conspiracy theories. Perhaps most alarming is the recognition that foreign powers, and most notoriously Russia and its Internet Research Agency, have systematically used social media platforms to attempt to disrupt the electoral process in the U.S. and other countries. Researchers and the U.S. intelligence agencies have found that during the 2016 election, Russian actors created large numbers of fake accounts on social media to spread disinformation. According to a U.S. criminal indictment, this effort continued into the 2018 midterm election campaign. Facebook, Twitter and Google’s YouTube have been criticized as too slow to respond. They have made some changes designed to strengthen mechanisms to detect and remove illegitimate content. For example, Facebook now insists on more transparency around political content that is promoted with its advertising platform. These changes have been occurring so frequently (and properly so) during the Commission’s deliberations that we believe attempting to provide a snapshot of developments at one particular time is not useful. A number of studies have shown that Americans trust local news sources more than national news media. For example, the 2018 Media Trust Survey from the Poynter Center found higher levels of trust in local newspaper and television news compared with national media. This result was particularly pronounced among Republicans: 71 percent said they trusted local TV news, compared with just 28 percent who trusted national network television news. Similarly, 62 percent said they trust their local newspapers, compared with 29 percent who expressed confidence in national papers. One of the primary reasons local news stands apart is that it’s often perceived as having higher levels of relatability and accountability. Proximity also plays a part. A local paper can have a tangible presence in people’s daily lives. Readers, especially those that take an active role in local issues, are likely to have met a reporter, they’re likely to have walked past the newspaper’s office on occasion and as a result they’re likely to have made a different sort of connection to the medium. It’s also often easier for readers to engage with [local] writers, which is important in the social media world of today. Unfortunately, local news organizations have undergone a dramatic financial decline over the past several decades, leaving many communities without local news sources. As people find themselves at a greater distance from those who create the media they consume, their level of distrust in those media is likely to grow. Americans tend to be more critical of “the media” than of “my media.” What they seem to mean is that although they are able to find news sources they trust, they are distrustful of media generally, including media that they may not have personal experience with. Changes in media technology led to the creation of cable news channels and later, internet news sources. The major sources of political news developed different partisan reputations, and these were liked by some parts of the political spectrum and disliked by others. Ideological news sources also had an ideological and professional incentive to use their platforms to attack the mainstream news media, and they did. Politicians and pundits in this polarized party system and fragmented media landscape had an incentive to also criticize the mainstream media and partisan outlets affiliated with their ideological opponents, and they did. This Commission’s charge is to ascertain the causes of the decline in trust in democratic institutions, particularly the media, and to recommend solutions. We have seen that democratic societies need trust in the legitimacy of their political processes and in the ability of their representatives to run the government properly. They also need a healthy distrust in order to hold those in power accountable, which, in a democratic society, depends on news media to report on what those in power are doing. It is time for bold thinking on how to revive the healthy combination of a distrust of power with a broader trust in the democratic institutions that have served the United States so well for hundreds of years. The Knight Commission is not in a position to recommend changes to the democratic workings of American society, e.g., issues of gerrymandering, money in politics or specifics relating to political parties. Nor does the Commission contemplate turning back the clock to a time when media choices were more limited or individual voices less prominent. But it can make recommendations that aim to place media in a more trusted and trusting place, to address the role of technology and online media entities, to instill more responsible actions from our leaders, and to foster better-informed, more engaged Americans. In the next three chapters, the Commission offers its recommendations for actions that citizens, leaders, governments and business enterprises (including media and technology companies) can take to advance these goals. i Richard Edelman, CEO of Edelman, is a member of the Knight Commission on Trust, Media and Democracy. ii On the economic impacts of globalization, see Matthew C. Klein, “How Many Manufacturing Jobs Were Lost to Globalization?” Financial Times, December 6, 2016, https://ftalphaville.ft.com/2016/12/06/2180771/howmany-us-manufacturing-jobs-were-lost-to-globalisation. On the effects of automation, see James Manyika et al., Jobs Lost, Jobs Gained: Workforce Transitions In A Time Of Automation, McKinsey Global Institute, December 2017, https://www.mckinsey.com/featured-insights/future-of-work/jobs-lost-jobs-gained-whatthe-future-of-work-will-mean-for-jobs-skills-and-wages. 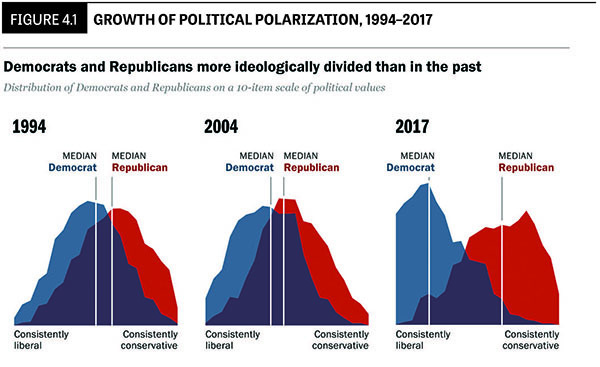 iii Pew Research Center, The Partisan Divide on Political Values Grows Even Wider, October 5, 2017, http://assets.pewresearch.org/wp-content/uploads/sites/5/2017/10/05162647/10-05-2017-Political-landscaperelease.pdf. See also a study by Michigan State professor Zachary Neal, “A Sign of the Times? Weak and strong polarization in the U.S. Congress, 1973-2016,” abstracted at https://www.sciencedirect.com/science/article/pii/S0378873317303039?via%3Dihub. iv The term was popularized by Eli Pariser in his book, The Filter Bubble: How the New Personalized Web Is Changing What We Read and How We Think (New York: Penguin Books, 2012). v Christopher Hayes, Twilight of the Elites: America After Meritocracy (New York: Crown Publishers, 2012), 17-18.
vi Matsa and Shearer, News Use Across Social Media Platforms. vii Edelman Trust Barometer for 2019.
viii Gillespie, Custodians of the Internet. ix See, for example, Garth S. Jowett and Victoria O’Donnell, Propaganda and Persuasion (Thousand Oaks: Sage Publications, 2014). x New York Times Editorial, “Facebook Cannot Be Trusted to Regulate Itself,” Nov. 15, 2018, https://www.nytimes.com/2018/11/15/opinion/facebook-data-congress-russia-election.html. See also Sam Dean, “Facebook data issues aren’t anomalies,” Los Angeles Times, Dec. 20, 2018, https://www.latimes.com/search/?q=facebook+data+issues+aren%27t+anomalies.